Today it is World Suicide Prevention Day. Many of the articles on this blog are light and about fun things, but at times, it is also important to discuss serious topics. Therefore, I want to tell you about this day and about what you can do to help people who are struggling with mental health issues and suicidal thoughts. The main aim of the day is to raise awareness about suicide prevention. The day is acknowledged worldwide, and all around the globe, different events are organized to mark this important day. As you can imagine, this article will be talking about suicidal thoughts and suicide, so if these topics are triggering to you, it may be better to not read it, or at least approach this article with caution. Please stay safe and take care of yourself and the people around you. World Suicide Prevention Day was first started in 2003. It is organized by the International Association for Suicide Prevention (IASP) and co-sponsored by the World Health Organisation (WHO). Since 2003, the day is observed on the 10th of September every year. In many countries all around the world, different activities take place. There are also global events. Two important global events are ‘Cycling Around the Globe’ and ‘Light a Candle’. People who participate in Cycling Around the Globe pledge to bike a certain distance while raising funds for organizations working with suicide prevention. Light a Candle encourages people to light a candle near a window at 8 PM today, to show support for suicide prevention, for the survivors of suicide, and to remember lost loved one. In 2014, 58.000 suicides were reported in Europe. 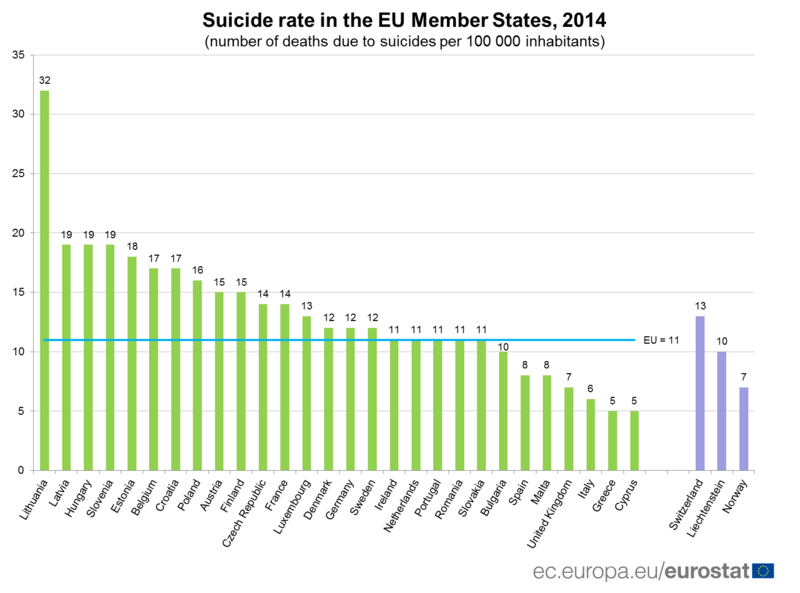 Lithuania had the highest relative suicide rate among the EU member states, with an average of 32 suicides per 100.000 inhabitants. Greece and Cyprus had the lowest number of suicides, with 5 suicides per 100.000 inhabitants. Globally, suicide is the second leading cause of death for 15-29-year-olds, while in Europe, it is the leading cause, according to the WHO. In order to reduce suicides worldwide, the WHO works with a Mental Health Action Plan that runs from 2013-2020. In the plan, WHO Member States have agreed to work together to reduce suicide rates by 10% in 2020. The World Suicide Prevention Day is one way of trying to reach this goal. Do your part: if someone close to you is struggling with suicidal thoughts, show that you are there for them. Be willing to listen, get involved, and spend time with them. You can also help your friend with seeking professional help. Be willing to reach out and speak up, and be honest and open with them. Practice self-care: You also need to protect your own mental health. There are many ways to do this. For example, you can learn healthy coping mechanisms for dealing with emotional pain or stress. It is also important to take care of your body. Reach out: If you are struggling with suicidal thoughts, there are many ways to get help. You can reach out to a close friend or a family member, or find a support group. If you are in direct danger, call a suicide helpline or the healthcare emergency number. Spread the word: Talk to others about World Suicide Prevention Day, or share information about the day on social media, for example. By breaking the taboo surrounding suicide and by taking care of the people around us, we can work together to prevent suicide. By working together, we can make a difference and save lives.